Yesterday at Pacific Standard I have a piece on the dilemma presented to advocacy orgs (I focus on disability, but I think it’s a general problem) by the Trump administration. From a PR perspective, they are completely toxic to any organization that is at all concerned about justice, social or otherwise. But from an influence perspective, you need access to do your job. I have a history – —all positive – —with NDSS. I signed on as an ambassador during the run up to the ABLE act, a bill designed to make it possible for some people with disabilities to save money for education and housing without losing their government benefits. There were rumors that the NDSS was telling the GOP they were willing to exclude adults diagnosed with disabilities in exchange for kids – —i.e., protect people with Down syndrome and ignore the needs of others, —but I thought the law overall was worth fighting for. Last March, NDSS included a Trump “MAGA” hat in a charity auction. I was sitting in a pub in D.C. late that night, as it happened, with a gathering of other disability -rights activist (and a stray medievalist or two), when my phone blew up with the controversy. I stepped outside, and personally called Sara Weir on her cellphone to make sure she knew what was going on. She emailed me a statement, and removed the hat from the auction, and I distributed her words across advocacy networks to calm the controversy. But right now, NDSS isn’t talking. I’ve repeatedly emailed them, called all the numbers I know, and asked these four questions. They are not responding, hence I’ve had to go more public. I say this not just as a journalist, but as a father of a boy with Down syndrome. To my mind, NDSS is just doing what it’s always done, seeking access and supporting laws help kids and adults with Down syndrome, even if the law ignores or actively hurts other marginalized communities. It seems to be increasingly a Down Syndrome First, organization, not a Human Rights organization. The DeVos debacle is a case in point. NDSS thought it was business as usual. They have a rich right-winger running their board, the head of the DS Guild of Michigan works/worked for the running mate of Betsy DeVos’ husband when he ran for governor. They used those contacts to get access, to get a photo op, to demonstrate that they are in the room where it happens. Then the community blew up, and liberal backers of NDSS quickly rallied to argue that the access was worth the bad optics, that it was just poor messaging rather than a sign of ill intent. I’ve never taken part in the non-profit wars within the Down syndrome community. There are a lot of hurt feelings and divisions, competition for donations and publicity, and some personality clashes (I’m told). But someday Trump will be out of office, and if NDSS wants to maintain credibility as a “Human rights org,” rather than a right-wing Down syndrome organization that doesn’t care about disability rights more generally, they are going to have to change course, and do so quickly. Emmett Till was a disabled black boy murdered for allegedly whistling at a white woman. An author has found the white woman, interviewed her, and in a widely shared Vanity Fair piece, told a reporter that the woman admitted she lied. This is not a shock that she lied, it is useful that she admits it, and there’s been a lot of good commentary from other folks, especially black writers, about the pressure to forgive. It’s important. I just wanted to highlight this twitter thread (with permission), which makes many of those arguments, but also emphasizes a key fact – Emmett Till was disabled. When I was doing research on disability and intersections, I came across something I’d never learned about the Emmett Till murder. Namely, that Emmett Till’s speech was affected by his bout of polio, so his mother taught him to whistle to clear his passages to speak. Many of the victims of racist violence in our nation’s history turn out to also have been disabled, because oppressions magnify and multiply. Maria Town was the disability community liaison over the last 18 months or so under Obama. I interviewed her. Remember when disabled folks had a voice in the White House? It was @maria_m_town. Betsy DeVos didn’t even demonstrate a wikipedia-level understanding of IDEA at her hearing. I made J.K. Rowling cry with this story. So that’s fun. Breaking the tweet thread for this one. I went to Obama’s Farewell. Remember the Enlightenment took place amidst chaos. Obama thinks we might need a new one. All the Trigger Warnings for this one. Graphic. Awful. Necessary to witness. I didn’t think I’d be writing much about the Middle Ages when I took this gig. Instead, I am seeing medieval analogues everywhere. I wrote The New Blood Libel about anti-Jewish hate then and now. Thanks for reading! I tend to be pretty extrospective about my writing, as writing about writing helps me write. I know it’s all been King Trump stuff lately, but I find it endlessly riveting/completely terrifying. Under the hashtag #NewVersailles, I’ve been watching the various ways in which Trump operates within a court culture, rather than a bureaucratic culture. I intend to write up about the classic “problem of counsel” this will create when things go wrong. Courts can, I guess, be a reasonable way to organize government function in theory, assuming the right monarch at the core. But this core, here, is rotten. If the protests this weekend are to be effective, we will have to do more than demonstrate opposition to Trump. We will have to demonstrate an ongoing commitment to one another through organized political action. Onward. We are the majority. Good piece in the New York Times: “For Trump, everything is a rating.” He, like many celebrities, has a long history of lying. Celebrity culture is also filled with paid PR folks maintaining bubbles of celebration. Which means it’s time to talk about the Emperor Nero, who decided to play the lyre, and wasn’t very good at it. But he really wanted people to cheer. What to do? I am persuaded by the general sense that looking at Central Asian dictators and their tacky grandiosity mixed with savage repression is the best analogy to what Trump’s doing now, but definitely want to keep track of ways in which historical examinations of kings and emperors help us better understand Trump’s court culture. The Frankish Racists are … Anglo-Saxons??? If Le Pen is going to claim heritage with an early modern Germanic tribe, shouldn’t it be the Franks? She might just mean the US and the UK though (which has it’s own WASPy problems). I haven’t tracked the use of “Anglo-Saxon” to mean “white,” but it’s a real problem for racists that “white” is a flexible modern concept with no real grounding in history. They address that problem with their own take on medieval history. Avec les succès surprise du Brexit et de Donald Trump aux Etats-Unis, “2016 a été l’année où le monde anglo-saxon s’est réveillé. 2017 sera, j’en suis sûre, l’année du réveil des peuples de l’Europe continentale”, a déclaré Marine Le Pen à la tribune. It’s clear here she means US/UK. Note – the US/UK is NOT Anglo-Saxon. And whatever happened to the Norman conquest? Will keep an eye on this usage. Matt Gabriele, a medievalist colleague, and have decided to coin this kind of framing, “nostalgic medievalism.” More to come, alas. 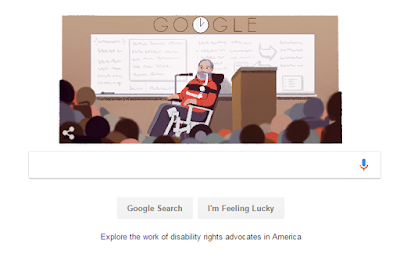 Description: A drawing of Ed Roberts, a man in a wheelchair with red shirt and grey pants, speaking into a microphone, oxygen tube in the corner of his mouth (as was true in so many pictures of him!). He’s in a classroom setting, a white board behind him, people listening (represented abstractly as heads of different colors) and GOOGLE on the wall. The second O in GOOGLE is a clock showing 2:00. If you click on the link – Explore the work of disability rights advocates in America – You get to a virtual exhibit funded by Google.org, organized by AAPD, curated by the amazing Allie Cannington and Amber Melvin, and written by me. It was part of the ADA25 celebrations. Some things I’m proud of in the exhibit. It starts by defining Ableism. The history of the disability rights movement is a history of oppression and resistance. It’s not some feel-good pablum about overcoming stuff. It’s an exhibit that tried, in highly constrained spaces, be at once joyous about the victories and real about the struggles. I also, with Blaise Zerega, interviewed Nora Roberts (Ed’s mom) and co-wrote a biography for the ADA25. You can read the image description and sourcing for Alice’s image here. It turns out about 400,000. 10%. He’s never “represented” those kids, just the polluters. Pruitt says he can’t sue if there’s no injury or standing. Booker responds – clearly there’s an air pollution problem, but Pruitt hasn’t done anything about it. Booker might talk about this in the context of disability instead of disease, if he asked my advice, but it’s a good clip, and he didn’t. I find the New York Times “disability” column on lives and identities, all written by disabled people, important and fascinating. It’s created a silo for disability on the page, which is better than no place at all, but still shows a lack of more systematic engagement with disability rights. But the NYT byline is a good one, and every disabled writer should try to place a piece there, if they have the energy. I think about this a lot. There are lots of disabled folks and their families who voted for Trump – millions of them. And of course every Trump voter will, if they are lucky, become disabled in time. Disability intersects with other forms of identity, ableism intersects with other forms of oppression, but neither is like the other forms of identity or oppression. Where the piece falls down, as many were saying on Twitter yesterday, is the how. I know, as well as anyone, the limitations of the op-ed form. No single essay can do everything. But there are a lot of folks deeply engaged in the how. For me, I focus on “Crip the Vote,” because I know the folks running it, but there are lots and lots of others. So let’s get to the how. When someone says they will be “sensitive” to the needs of people with disabilities, I get nervous. Being sensitive is like “awareness” campaigns. It doesn’t do anything. One: Hassan and DeVos on vouchers and special ed. Hassan – It’s not just ideas, but how they work in practice. DeVos: I’ll be sensitive to special needs students. Hassan: No, it’s about enforcing the law not sensitivity.